How high by the 6th of July? As I said last year, the saying actually goes "knee high by the 4th of July," referencing corn and its temporally desirable height, historically the harbinger of a good harvest. What a difference a year can make. Evidently last spring was wet and chilly, which I&apos;d somehow forgotten, perhaps driven mad from our record heat wave. As WBEZ&apos;s business reporter Scott Kanowsky reports, Illinois corn farmers and commodities investors fear the effects of the Midwest drought and heat. He tweeted further, "Trading on corn futures at CBOT continues to go up and up — to $7 a bushel. Today&apos;s Chicago weather forecast: 101 degrees." Which all means world food prices may or may not go up. "The world needs to take a hard look at speculation on the financial markets and its potential impact on food price volatility, FAO [Food and Agriculture Organization of the United Nations] Director-General José Graziano da Silva said today at a high-level debate on the issue at FAO Headquarters in Rome." 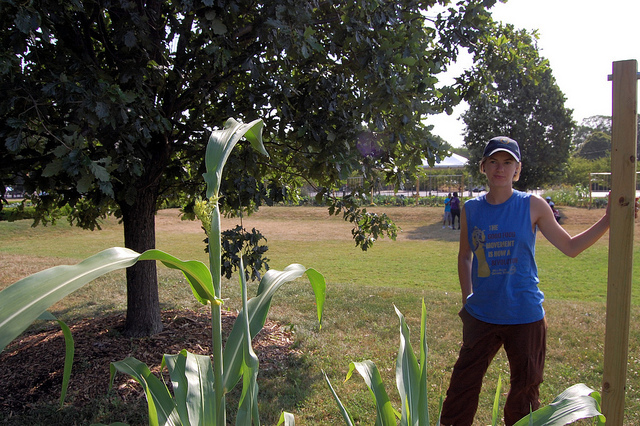 At a mere 88 degrees in the 8 o&apos;clock hour yesterday morning, I went in search of the state of our corn, in the heart of the city. 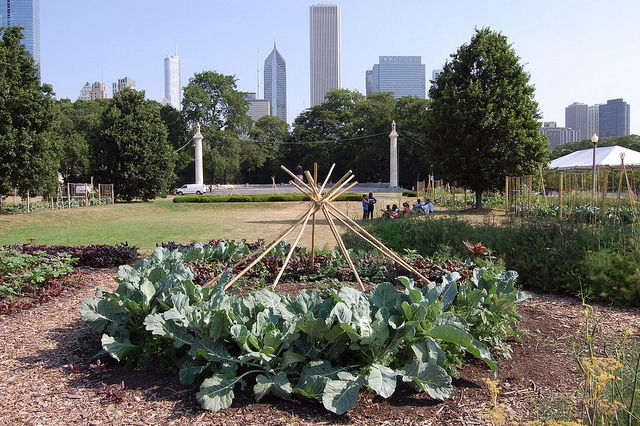 Just northwest of Buckingham Fountain, amid streets closed with white tents blooming for the impending Taste of Chicago, Art on the Farm grows. 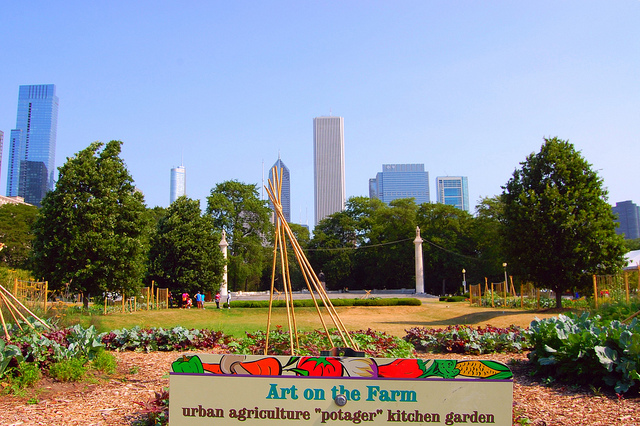 An urban agriculture potager — French for kitchen garden — it&apos;s the work of Growing Power, "a national nonprofit organization and land trust supporting people from diverse backgrounds, and the environments in which they live, by helping to provide equal access to healthy, high-quality, safe and affordable food for people in all communities." You may have seen founding farmer and CEO Will Allen recently on The Colbert Report, with his new book The Good Food Revolution. Art on the Farm manager Lauralyn Clawson showed me their corn, an heirloom broom corn, one of over 150 heirloom varieties of vegetables, herbs, and edible flowers grown on the 20,000 acres. 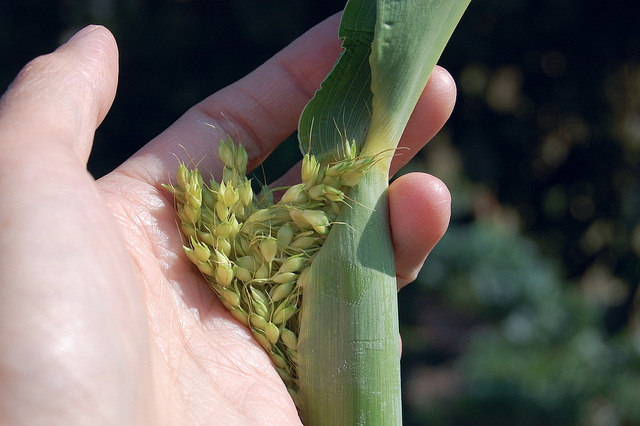 Broom corn, technically sorghum, forms a cluster of seeds where you&apos;d expect to find an ear, feeding birds not people. The stalks are dried and made into brooms, which will be found at Growing Power&apos;s farmers market stands, or used at their Iron Street farm in Bridgeport, where edible corn grows. 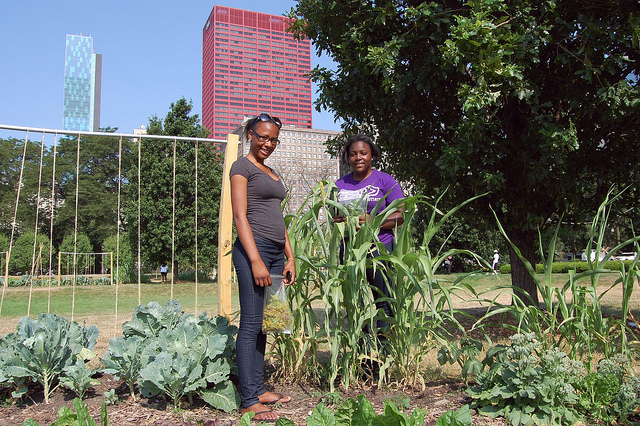 Lauralyn, also the Market Basket Coordinator, directed a team of about a dozen teens, most from After School Matters, to pick collard greens, mint, dill flowers, and bright orange edible blossoms — to be sold immediately at the Daley Plaza Farmers Market a mile away. I asked the kids if they bring anything home. They looked at each other before one girl said, "We can, but..." — her answer trailing off into the increasingly hot sky. Growing. It&apos;s always a work in progress.